The first thing we had to do in Panama City was collect the bike. We have travelled 22,199 kilometres in South America over five months. We have ridden to the bottom of the road at Ushuaia, crossed the Equator and we are now heading north to meet mates in Texas next month and then on to Alaska. Collecting the bike was simple enough but it was running very badly so we headed straight to BMW Panama City. Next stop was to get our $800 back from Avianca airlines. They assured us it won’t be a problem, but it will take three months – bloody hell! And, of course, we had to buy insurance. A lot of time is taken up with the paperwork on trips like ours! 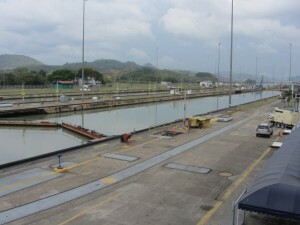 The one thing we really wanted to see in Panama was the canal – that masterpiece of engineering. We have to admit that we were a little disappointed. 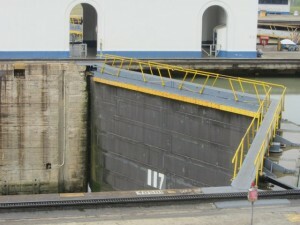 It didn’t seem very big and there were no ships making their way through the locks. Oh, well. When we think about all the things we have seen this is our first disappointment – pretty amazing really. We visited the islands that have been joined to the mainland by a road constructed from rocks removed to build the canal. Today the wealthy moor their yachts here and there are some fantastic restaurants. In stark contrast is the old city, once a dangerous slum. 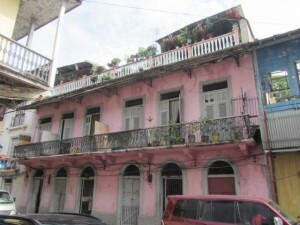 Today the government is trying to gentrify the area, restoring the colonial buildings to their former glory. It has been declared a Unesco World Heritage site and will be magnificent when the work is completed. 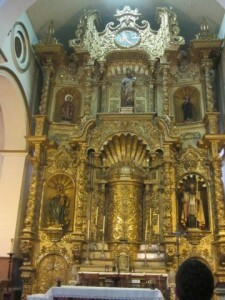 One of the highlights is the Iglesia de San Jose and its golden altar. When pirates sacked the city the priest painted it black. Legend has it that the wily old priest even convinced the pirates to contribute to a ‘fund’ to replace his lost golden masterpiece! 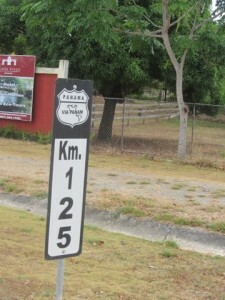 From Panama City we headed to David for the night and then crossed the border into Costa Rica. There was no time for sightseeing. We spent a night in the capital, San Jose and then headed for Nicaragua. We have less than a month to get to Texas. love what your doing. My wife and I would like to do UK and Europe on a bike. Thought we would buy a bike in UK etc. But has turned out to be impossible with out UK drivers licence. Just to let you know a few years ago we bought a small yacht in the UK and sailed it to Greece over 3 years. So we some experience and persistence. You shipped your bike from Australia. My question to you is How did you get the insurance for the bike and 3rd party property etc sorted because so far I haven’t been able to crack this nut. We did ship our bike from Australia to the UK. We didn’t take out insurance for the bike as it was too expensive. For the third party we got ‘green card’ insurance through a company in the Netherlands. We have used Maria on all three of our trips and have never had any problems. Trust that you are both well and the beemer is singing along. Getting geared up this end for the wall to wall again and doing a cpl of weeks with Biddy around NSW before heading to Cairns with the bride…..
Might even try to make echuca and say gday to Stephen..
Keep enjoying it all and stay upright. Fantastic pics. Especially of the Canal. It is visually disappointing but so interesting how small scale it actually is.